Hello I have a Male African Ringnneck would it be okay to breed him to an indian ringneck? If they did breed would there offspring be sterile and weak? I dont want to sell this bird nothing id love to breed him to an African Ringneck female but so far i havent found any were i am at. Psittacula krameri manillensis is your indian ringneck. Psittacula eupatria is your alexandrine. They have been hybridising alexandrines with indian ringnecks for a long time so there should be no reason an african and indian ringneck shouldn't be able to breed. You often get hybrid vigour with crossbreeds. However whether you will get hybrid vigour or sterile mule offspring I don't know. When crossbreeding or breeding any sort of animal you have got to ask yourself why you want to do it. If they breed can you look after the youngsters and provide the right conditions for them. Can you find good homes for them as even pure bred birds are not always easy to find homes for. They are subspecies so they should be able to breed and so your saying theres a 50% chance of the offspring bein fertile or sterile? Im not so worry about that as I will keep one and the rest give them to my nephews who really want one. I am just worried about the health will they be weaker than the average IRn or Arn? What would the temperament be like? Also could I breed my aRN to a lets say blue Indian ringenck? Will it live as long as an indian or African ringneck? Interesting question, but I am not sure that much of what I know would be valid when it comes to birds. All of my breeding experience pertains to mammals. Most of the breeding in mammals are all done within the same species of animals such as with horses and dogs, they are all the same species but are sometimes different breeds such as Thoroughbreds and Arabians or in dos, Boxers and Collies. The primary species crossbreed that I am aware of is that of the Donkey crossed with a horse producing a mule. With birds there are not really different breeds they are all pretty much different species of birds and most of the differences that we see are mutations of the same species. I do have a female parrotlet that is a hybrid. She is now about 12 years old, but I do not know if she is fertile or not. She appears to be as healthy as any of my other birds and her basic personality seems to be pretty much the same as any other parrotlet that I have either seen or read about. I really can't say any more than this because I just don't know, but I hope that this will somehow prove to be helpful to you in some way. Lori, your questions are valid. Though I enjoy watching the babies my big concern is what to do about them when they are grown. When my Cockatiels would surprise me I had an awful time about the babies. They are my babies too and I work hard to find them homes. I put a high price on them but do not collect. The price is to weed people out. Their personalities appear very early. The last I had to rehome was Columbus. He was an only baby that year and would not stay in the nest alone. He came out much earlier than he should have and was claimed by the whole flock. I had a lot more in this post but deleted it. The main thing about this post is why would you want to add more babies to the world when so many birds are already homeless, abused or neglected. The owner of the store acquired many more Tiels from people who could not or would not keep them. The flock grew but he did rehome some. Farm Coop people are known by personality as well as name. I taught him how to rehome and educate the new humans before letting them go. Columbus was 12 and still singing when I moved. Yes, ARN can breed with IRN but it seems to me that you don't know enough about parrots in general and breeding in particular so I would highly recommend you don't. Breeding is not just a matter of putting a male with a female and 'allowing nature her course'. Nature does her own thing and does it very well but that is in the wild, not in captivity. When it comes to pet birds, breeding them is something that not only requires a lot of knowledge (about their physiology, calcium needs, problems that might happen to the babies even before they are hatched -humidity, temperature, parent feeding, etc- to handfeeding correctly -not as easy as people think! etc), it also prevents you from enjoying those birds as pets. All the psittacula species are aviary ones which require frequent and experienced handling to remain pets even when you have a single one so if you get the male to bond with the female and have babies, you will, pretty much, lose those two birds as pets because neither of them will ever like you again once they have each other. I have also bred different types of animals cows, horse, and pigs are some. I havedone a lot of research but have not found much about breeding ARN with IRNs i have the money time and space for a lot of birds so that wotn be a problem. Id love to breed my bird with a ARN but they are extremely hard to find in my area. I already tried. I have done extensive reasearch on breeding parrots and watched many videos, i feel i cn tak eon this challenge I will never learn if I dont try. I am not concern much if the offspring will be sterile or not I am concern if they Will be weak. I want to raise a parrot as young as possible I originally baught my bird thinkin it was a baby still, it wasnt. It is very old and if I even try touhing him he screams and will bite. I have been working hard, but seems like he is too old now to be tamed. Not that it isnt possible i have been making very very litte progress, but i hav emade progress taming him. 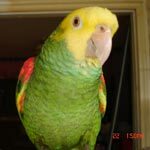 I am not lookin to sell the birds also I just want healthy parrot one for me the rest to a couple nephews I have. I don't breed any of my birds and to be honest about it, although I think that breeding knowledge should be a part of every parrot owners knowledge base, I have no desire to breed birds at all. I would be much more interested in knowing more about your bird, such things as does it have a band on its leg, where in the world do you and it live, what its diet is and what things that you have done in your efforts to hand tame this bird. I am fascinated by not only their beauty but by their intelligence, their responses to things and the individuals that they live with and their responses to their environment. So I guess you could say that my interest is in their physical, mental and emotional well being more than anything else. I am living in southern california. I live my burd too it is a beautiufl bird. I started slowly givin him pellets instead of just seed and that was dificult because he disnt want to eat them he only ate seed like in the bird store so i started putting in small amount of pellets and fruits and veetables with the seed untill I was able to make almost all his diet pelets and vegetables. I tried to put my hand in the cage as often as possible and just leave it there without moving it. Untill he would stop screaming and moving around I would tkae it out and then again put it in and repeat the same process again and again. I also open his cage up, after closing every door covering every window and mirror and just let him fly aroung my living room and fly from one perch to another (i set up perches in every corner). Also while he is doing that i just sit down and talk to him offering treats (cashews are his favorites i put a bowl with different treats an de only ate the cashews) but he of course never takes them. After i let him fly around for a while i get a long wooden stick about a yard long put it under his feet untill he hops onto it and then i put him back in his cage. I also completely stoped giving him seeds, now i get a spoon with a cashew in it and put it in his cage while I hold it and he grabs it just a couple days ago he got enough courage to grab food from my hand so that made me real happy. Basically I took away all treats or things like seeds and I get him tire by letting him fly aroung my house then i offer treats that he has to get from my hand (i always offer them through the wires of his cage.